The fashion for insect motif jewellery was one that emerged in force in the late 19th century. The Victorians, with their diverse tastes and imaginative designs, created jewellery that featured creatures ranging from fanciful to occasionally unsettlingly accurate, naturalistic beasts. The fashion persisted into the early 20th century and the most popular of these jewels at auction today are those with the most decoration. In The Jewellery Auction on 24 April, McTear's is pleased to present lot 135 - a bar brooch with matching earrings. 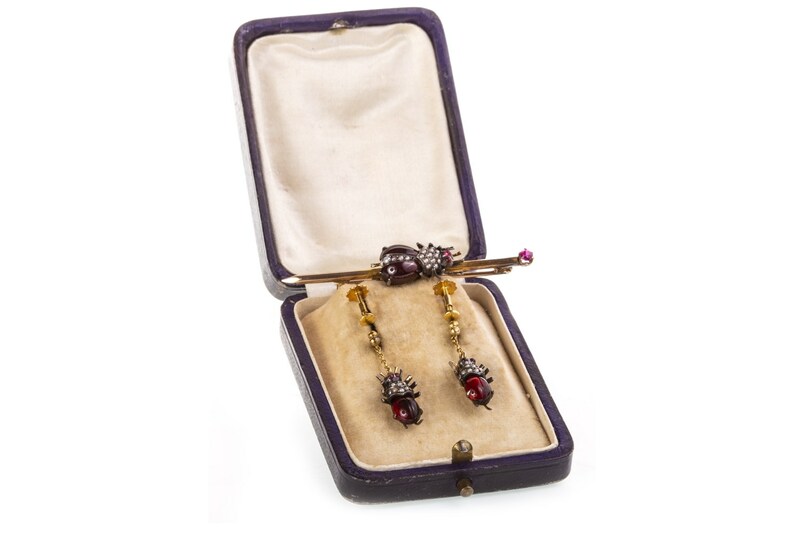 Dating to the turn of the 20th century, this set features cabochon red gems and seed pearls. Perhaps you would like to give a home to these sweet minibeasts? They are estimated at £100-150 and are just one of over 160 lots in the auction.